Anyone that knows Lee will know he is never far from a box of tissues, in the summer it is due to his hay fever and in the winter it is due to having a constant cold, so we are taking part in the block that cold challenge with NasalGuard to see if we can beat the germs this year. Lee finds it very draining constantly having a cold, it affects his schooling and socialising with Friends, we are having to take time off work to look after him which obviously comes natural, then the bills don’t get paid, having the constant battle with germs is hard work as they spread so easily around a household. 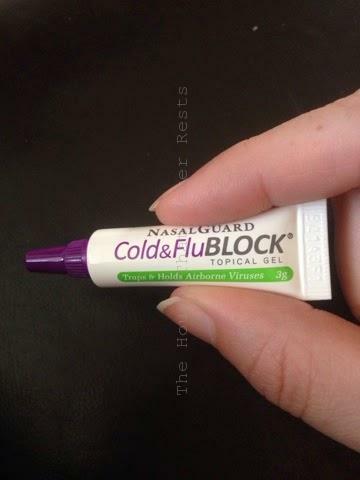 The NasalGuard cold & flu block, this is a 3g gel that traps, holds and immobilize airborne viruses, it is to help reduce the likelihood of getting sick from cold and flu viruses, the gel is drug free and non-drowsy. NasalGuard has a patented formulation containing cosmetic grade ingredients, which creates a positively charged gel that blocks negatively charged viruses on contact before they enter your nose. We are all going to be using the cold and flu block in our house this year, we are not going to let the germs beat us, we are looking forward in seeing how well it works. You have to start using the gel before the flu seasons starts and use daily for the best results. You will only need 1-2 drops of the non greasy gel, put the drops on your finger, rub your finger and thumb together, apply a thin layer around your nose and on your upper lip, you can re-apply throughout the day if you wish and there are no horrible odours. Being drug free this product is safe for children, pregnant women and breastfeeding mums. It can be worn under or over make up and one tube holds around 150 applications. This products cost’s £11.99 and can be purchased at boots, superdrug or sainsburys, there is no prescription needed. Disclaimer : We was sent a NasalGuard cold and flu block in exchange for our review all thoughts and opinions are 100% our own. I am definitely going to keep this in mind for winter when I no doubt will get a cold. We are looking forward to the challenge as Lee is always getting colds. Lee is always getting them. We are looking forward to the challenge to see if it helps Lee this year.